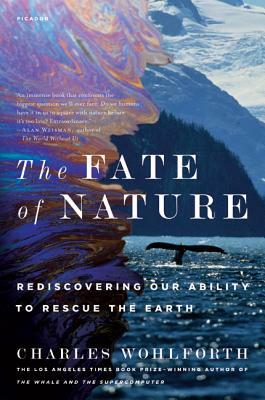 The Fate of Nature is a profoundly relevant call to action from journalist Charles Wohlforth, whose award-winning reportage addressed the infamous 1989 Exxon Valdez oil spill. In the wake of the tragic 2010 BP disaster, Wohlforth's voice has never been more necessary. Using as a stage coastal Alaska, populated by an array of odd and inspiring characters, he presents both an insightful assessment of our present state and a hopeful vision for our planet in his "thoughtful and felicitous new book . . . an inspired view of humankind's future" (Anchorage Daily News). Charles Wohlforth is a lifelong Alaska resident and author of The Whale and the Supercomputer, winner of the L.A. Times Book Prize, as well as many other books and articles about nature, history, politics, and travel in the North. An avid cross-country skier, Wohlforth lives during the winter in Anchorage with his wife, Barbara, and their four children. In summer they live off the grid on a remote Kachemak Bay shore reachable only by boat. Wohlforth began his career as a reporter for a small-town newspaper. As a reporter for the Anchorage Daily News he worked months in the field covering the Exxon Valdez oil spill. “The Fate of Nature is an important and compelling read. Wohlforth develops critical, unexamined issues about our relationship to nature through the vivid characters and magnificent landscapes of coastal Alaska. You'll be intrigued, and you may be changed.” —ROBERT F. KENNEDY JR.